. The thought of a Probiotic mint is very intriguing since I work in a Pharmacy and I am used to dealing with digestive probiotics. EvoraPlus has freeze dried probiotics. What do they do? Basically there are good bacteria and bad bacteria. 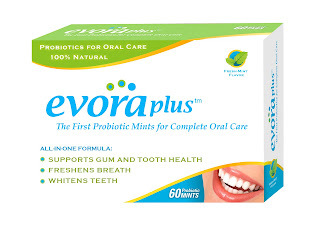 EvoraPlus insures that you have the good bacteria so that you can maintain a balance in your mouth. "When the EvoraPlus mint melts on the tongue, the freeze-dried probiotics activate and attach themselves to the teeth and gum tissue, establishing colonies of active bacteria both on the surface of the teeth and deep beneath the gum line. These colonies compete for nutrients and interfere with the harmful oral bacteria that disrupt gum and tooth health, and also cause bad breath." Pretty Cool! So, EvoraPlus not only makes your teeth whiter, but it freshens your breath and leads you to have healthy teeth and gums. Did you know that Periodontal disease can lead to other serious health problems such as diabetes, osteoporosis and heart problems? EvoraPlus is here to help! EvoraPlus is 100% Natural and effective for all ages! It is recommended to take one mint twice daily after brushing. The first thing I noticed and loved about the EvoraPlus was the packaging. They package each mint in it's own bubble and the packaging is perforated so that you can rip off one mint at a time. I immediately left 3 mints by the sink in the bathroom as a reminder and I put 2 mints in my purse in case I needed them at work or outside the house. The mints themselves are very small. You melt them in your mouth after brushing. They don't have a minty taste (or if they do it is masked by my toothpaste!) They actually had a bit of a milky taste (probably the hydrogen peroxide) but I hardly taste it at all. After a few minutes, the mint is gone and I immediately feel healthier. They have definitely whitened my teeth and made my breath smell better! Which is particularly amazing right now since I have had some congestion. No more sick dragon breath. I highly recommend these mints. If you want to learn more about Probiotic mints visit EvoraPlus or Linda the Probiotics Tooth Fairy (yes...tooth fairy). Where to Buy: You can buy EvoraPlus at EvoraPlus.com, Drugstore.com, Walgreens.com, Target.com and CVS.com and the following retail stores and distributors: A&P, Pathmark, Kerr Drug, Cardinal Health, HD Smith and Swansonhealth.com. disclaimer: I received a box of EvoraPlus in exchange for this review. I was not compensated in any other way and these are my own honest thoughts and opinions. Visit EvoraPlus and tell me why you want to try EvoraPlus. "Do you want white teeth & fresh breath? @Latsyrc728 has an EvoraPlus @EvoraPlus #giveaway http://bit.ly/bAFLiC (02/10) #contest"
Giveaway ends 2/10/10 at 9pm EST. Giveaway is for US residents only. Winner will be chosen randomly. Winner will be contacted via e-mail and then will have 48 hours to respond before a new winner will be chosen. i want to try these because they are 100% natural!! Twice daily use of EvoraPlus can help safely maintain and promote oral health by normalizing the balance of the indigenous flora in favor of microorganisms associated with both healthy teeth and periodontal or gum tissues. I like how great it is for your gums, mine are always sensitive etc. would love to try it, thanks for the giveaway and details etc! I'm really intrigued by the fact that they contain probiotics and are natural. I entered the Return to Beauty giveaway. I am an EvoraPlus FB fan. The idea of a mint that actually HELPS your teeth and gums is a very unique idea. What a great giveaway! Evora sounds like a great product because it doesnt just cover up the problems like normal whiteners, it actually improves gum health! I want to try this because it whitens teeth!